Whether you’re having a fundraiser, school event, church event, or just a day of fun. 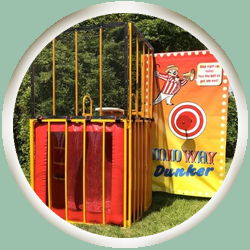 the dunk tank is a classic attraction. Get the mayor, principal, teacher, preacher, or whomever you want, as long as they’re of age. Must be 18 years or older to sit on the plank. Customer must arrange for water availability through water hose or other means.